I wear crystal frequently, almost daily. I wear them to encourage certain traits to develop, I wear them because they match my outfit, and I wear them for their healing powers. I receive many comments and am often questioned about the crystal jewelry I wear. If you're anything like me, you are incredibly attracted to gemstones. I'm guessing you do because why else would you be here reading about the seven must-have crystals? Equally prized are the semiprecious stones such as those found on this list: Amethyst, Clear Quartz, Rose Quartz, Citrine, Howlite, Sodalite and Tigers Eye. While crystals are incredibly fascinating and beautiful—and this adds to their value—they each also hold a sacred meaning. Many stones and crystals have been used for thousands of years. In ancient cultures the healing properties of a crystals was as important as their beauty. These properties remain in crystals today. There are the flamboyant crystals that are eye-catching and incredibly popular. There are also quieter, less outwardly attractive crystals that are nonetheless extremely powerful. Whether the gemstone is found in it's natural state or faceted and polished, they are equally powerful. Gemstones can be easily overlooked when in their natural, uncut state and often cost a fraction of the price of a faceted stone. And with so many crystals and gems on the market it's hard to know what to choose, especially if you haven't shopped for crystals before. I’ll start by saying, go with your instinct. If you are drawn to a specific stone, there is probably a reason. Do some research about your choice and discover what it is telling you. Beyond this intuitive decision making, I would say you'll want a selection of crystals that can be used for a variety of purposes. 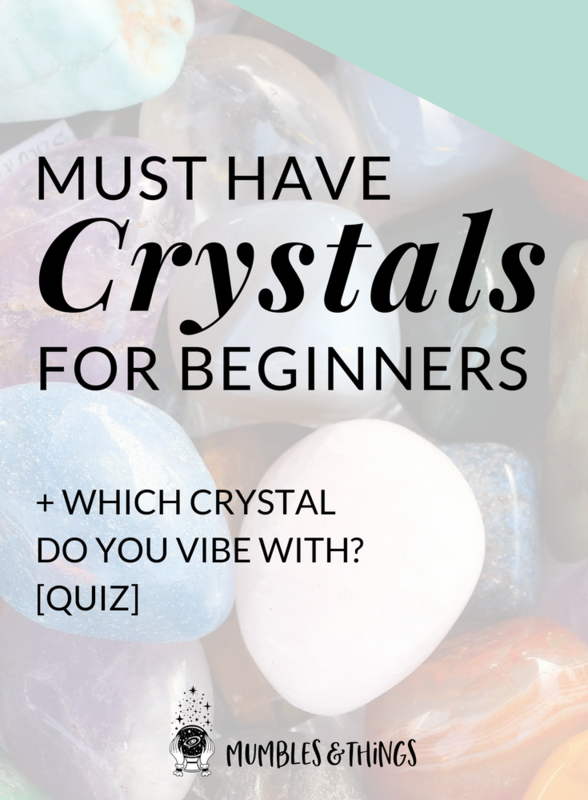 The crystals on this list are the ones that I come back to over and over and the are a good place to start building your foundation on: Amethyst, Clear Quartz, Rose Quartz, Citrine, Howlite, Sodalite and Tigers Eye. Browse through, read the descriptions, and notice if one (or two) is calling to you. Knowing how to use these crystals is vital if you are to make use of the gifts they offer. People seem to love or hate Amethyst (The Stone of Spirituality and Transformation), with very few falling in the middle of the spectrum. Whatever your feelings about Amethyst, it is good for almost every type of magic and is full of goddess energy. Keep a small piece of amethyst with whatever tools you use for divination, such as tucked into the bag that holds your tarot cards. Wear or carry for the sobering effect on overindulgence and physical passions. Place geodes and clusters in your environment to experience their energy. Use Single points for healing properties: place the point end toward you to direct energy inward and away to draw out negativity. Sleep with it under your pillow to help with insomnia and nightmares, to facilitate out-of-body experiences and to bring intuitive dreams. Place over the third eye chakra to stimulate it. Clear Quartz (The Stone of Power) is a unique crystal, because it is considered universal in its ability to help with a variety of issues. Because of this, it is ideal for beginners. Its effects are easily observable because it enhances the personal energy of the wearer. Clear Quartz can be “programmed” to hold whatever intention the wearer desires and to magnify that energy. It is associated with many aspects of witchcraft: the Goddess, the moon, the sun, and the fifth magical element Spirit. Place pieces on a your body to provide healing to that/those area. Create a crystal grid of protection for your room or home by placing Clear Quartz in the corners of a space. Hang in front of windows for protective decoration. Use for moon related rituals. Use to cleanse and recharge other crystals. Use this all-purpose stone in practically any other way imaginable. The pink color in this form of Quartz is thought to be caused by the inclusion of Iron and Titanium. Historically, Rose Quartz (The Love Stone) is a symbol of love and beauty. Rose Quartz enhances all forms of love: love of self, a mother’s love, both platonic and romantic love as well as general caring and kindness. It encourages us to be gentle, peaceful and tender and helps us to opens our hearts. Rose Quartz teaches us forgiveness and tolerance. This truly is a peaceful and calming stone with energies that are gentle and nurturing. A good stone for pregnancy, care givers, lovers and fertility. Honestly, if I had to choose one crystal from this list it would be Rose Quartz. Who doesn't want or need more calm, joy and love in their life? Hold Rose Quartz during meditation to allow it's gentle energy to calm you. Wear it as a pendant over your heart to open and balance your heart chakra. Give as a gift of renewed friendship, especially at Beltane. Keep Rose Quartz on your bedside table to promote restful sleep and harmonious partnerships. Citrine (The Stone of Abundance) is pale yellow in color. It brings happiness, joy and optimism into your life. One of a few minerals on the planet which do not hold or accumulate negative energy, but dispels and transforms it. You don’t have to cleanse Citrine, because it doesn’t hold any negativity! Citrine energizes and invigorates and it promotes comfort, energy and warmth. Aids in matters of daily living. It is said Citrine will open the mind to new thoughts. Often referred to as the money stone because it is said to attract abundance to you and also teach you how to maintain that abundance. Place with your cash box to encourage growing abundance. DO NOT leave in direct sunlight! Use to cleanse other crystals. Meditate with Citrine to cleanse any of the Chakras. Howlite (The Stone of Goals) can be used to encourage emotional expression, to facilitate awareness, and to calm communication. It spurs one on towards the completion of goals and assists with removing hesitation. It dispels criticalness and selfish attitudes. It builds towards a decency and encourages those attributes that are building blocks to spiritual growth. This stone is mostly famous for its ability to be dyed to look like Turquoise. Dyed Hoplite is known in the trade as Turquesite. Meditate with Howlite to mitigate anger. Create a grid around your bed, or place it under your pillow, to promote restful sleep. Carry in your pocket to absorb negativity. Place on your third eye to help with dream recall, past life recall and spiritual journeying. Sodalite (The Stone of Insight) gets its name from its high Sodium content. It has been said that the journey from your head to your heart is the longest distance you will ever travel. This is the message of Sodalite. Use Sodalite to aid in re-establishing inner peace and assist in clearing up mental confusion. Sodalite bridges the gap between your thoughts and your feelings and strengthens the power of mind over body. It is said to offer a cooling effect and may assist with communication difficulties causing disagreements between couples. It is the stone of logic and is very useful in group situations. Sodalite is a stone for insight, logic, peace, and truth. Wear during protests or when you need to stand up for yourself and your rights. Place on your wifi router to block electromagnetic pollution. Bring to meetings to promote companionship and collaboration. Meditate with it to give you guidance on the right decision or plan of action. Place on third eye to deepen and enhance meditation and stimulate your intuition. Use when doing a tarot reading or other divination activity. Tigers Eye (The Stone of Brightness) is a combination of Crocidolite fibers and Quartz Crystal. The fibers shine (chatoyancy) with wavy band of light causing the cat’s-eye effect. This stone is helpful for seeking clarity and enhancing psychic abilities. It is said to encourages one to open us and bloom, it illuminates the blues and bring brightness to ones life. It is also said to bring awareness to ones needs. This is a good stone for “earthy” people and promotes intuitive practices. Place on Solar Plexus Chakra for spiritual grounding when you feel spaced out or uncomitted. Wear or carry for protection against ill wishes and/or curses. Meditate with Tigers Eye to promote higher self-esteem and confidence. Remember the crystals effects take place on many levels. These effects can be experienced differently by different people. Color, structure, and chemical composition are all factors that determine how they will effect us. You may feel the effects immediately or the connection may not be noticed at all. No matter how they effect you, they will effect you in some way. 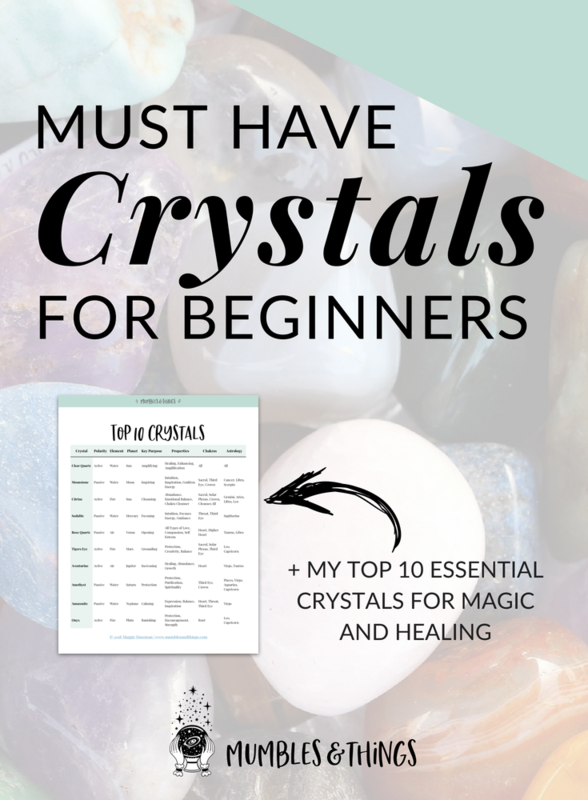 If you want to download my list of Top 10 Crystals simply click the button below. Enter your name and email address the click the link to download the pdf file.